MI PRODUCTS has developed the FX15 threshold, said to be a compliant to Document Q (ADQ), Part M and SBD solution, an integral part of the Lifetime Homes standard. LEKA SYSTEMS has introduced the Eco range, a more price competitive extension to its existing Warm Roof and Orangery roof. 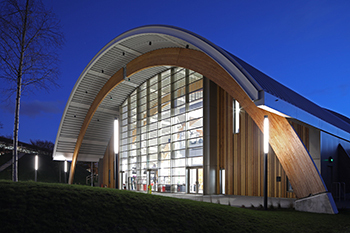 The SF52 aluminium curtain walling system from SENIOR ARCHITECTURAL SYSTEMS feature in the refurbished Slough Ice Arena. SIKA sealant and adhesive were chosen to bond glass panels to a steel frame in a multifaceted glass roof installed at The University of London’s Senate House. The Curve, a newly opened two-storey community hub in the Bryn Gaer Place housing development in Newport, includes a faceted curtain wall completed in the SL52 system from ALUK as its centrepiece. Work has begun on the installation of two types of curtain walling from KAWNEER on Newcastle University’s new £40 million teaching and learning building. Coventry-based Aztec Windows has completed its first installation of a WINKHAUS AV3 and FAB locking system from its Grand Entrance Collection in a Solidor French Door. Roof window manufacturer VELUX has been awarded “Best Services Product” at this year’s Housebuilder Product Awards for its Velux Active smart home technology product. ATLAS has revealed its Installation of the Year winners. ODL EUROPE has responded to 30% year on year growth by taking its Bootle factory to a 24/7 shift pattern from next month. Composite door manufacturer APEER has responded to demand by repositioning Light Grey from its premium colour range into its standard offering. HOPPE is offering a ten-year surface and mechanical operation guarantee, on coastal as well as inland installations, on its new Altanta range with Resista finish. Window and door fastener supplier RAPIERSTAR is creating a new Learning & Development Centre. ULTRAFRAME has announced new dates for its Solid Roof Sales Training Course for installation companies selling its Ultraroof system. Over a century and a half of history was saluted when Scotland’s oldest glazing company received a special Outstanding Service Award from the Glass and Glazing Federation. The Glass and Glazing Federation (GGF) is pleased to announce that it is supporting the inaugural Conservatory and Orangery Awards and will also be involved in the judging process. DECEUNINCK is now the title sponsor of the Belgian Quick-Step cycling team, currently ranked No.1 in the world according to Pro Cycling Stats. The GGF has once again agreed to host the UK Pavilion at Fensterbau Frontale in Nuremburg in March 2020. REHAU will be showing its newly-launched Rio Flush Fit window on the Maco Hardware stand (J40) at the FIT Show as well as taking part in a number of seminars. PREFIX SYSTEMS has updated its 20-page Warmroof Product Guide with additional technical information, new CGI’s and cross sectional images. Elsewhere, while the GGF had been the source of many negative headlines not long ago, Chief Executive Kevin Buckley has spoken this week of a year of ‘significant progress’ along with the prospect of much more to come in the future. Among all that, we hope there is something in this week’s issue for everyone. GGF Chief Executive Kevin Buckley has marked his first 12 months in office by proclaiming the organisation’s ‘significant progress’ in that time and praising its members for their loyalty and commitment. He also emphasised the importance of listening to members, saying it was a misperception that the organisation did not keep in touch with members or value their views: “One thing that I have found most worthwhile this last 12 months, has been discussing GGF activities with our members and listening to comments and suggestions. Jeld-Wen has announced plans to launch the Timber Windows Partnership, a new network for installers across the UK to offer a supply and fit windows, doors and stairs with the backing of the manufacturer’s brand. The company will use its debut appearance at the FIT Show for the official launch of the initiative, which will also be supported by a training and development package for participants. Sales manager Norman Setra, who will be at the show to explain about the partnership in more detail, said: “This is a brand-new approach for Jeld-Wen and we are looking forward to meeting existing and potential new partners to discuss the scheme, and showcase timber windows in a new light. The search is on yet again for the UK’s best ‘Window with a View’ in the fourth annual competition organised by MyGlazing.com to find the most striking view from any window in the country. Historical buildings, museums, hotels, skyscrapers, offices, and of course ordinary homes – wherever it is taken from, the GGF’s consumer advice site wants everyone to look out and snap the window with the view beyond. This year, 11 regional winners will be chosen by a panel of photography, architecture, travel and tourism professionals before a public vote is launched to determine the UK’s very best Window with a View. Ultraframe has saluted seventeen of its staff who have each chalked up 25 years working for the manufacturer. The staff, from departments all across the business, will now become part of a Hall of Fame launched by the company to mark their achievement. CEO Julian Slade paid tribute to the 17, saying:: “Our success is entirely due to our people. We are lucky to have so many talented and thoroughly nice people, who have dedicated their careers to Ultraframe and to providing such an excellent service to our customers. The refurbished Slough Ice Arena. Editorial submissions intended for the next issue should reach us by noon, Tuesday please. Patrick Calvey has been appointed as Sales Manager for SIEGENIA in a newly established position heading up the UK & Ireland sales team as well as covering the South East of England. John England is the latest in a number of ‘heavyweight’ appointments to the PROMAC GROUP, joining as Sales Manager with responsibilities for PVC-U sales and business development. Andrew Oldham has returned to Llanelli-based Total Doors, as business development manager for England and Wales as part of a strategic growth plan. Martin Althorpe, Technical Director of Epwin Fenestration Division has been elected President of the British Plastics Federation. Ken Wilson has been appointed Managing Director of window hardware manufacturer CALDWELL. Dublin glass processor and manufacturer Kish Glass has made investments in a HEGLA EcoLam cutting table. LEKA SYSTEMS will be using the FIT Show to unveil its latest innovation, the Xi Conservatory Base System. EPWIN WINDOW SYSTEMS will be launching its new ‘star performer’ at 11am on Tuesday 21st May on Stand N5 at the FIT Show. APEER will be showing new products at this year’s FIT Show, stand L40, including its new Silka smooth-skin residential doors. HOWELLS PATENT GLAZING will be unveiling a new rooflight at the FIT Show, stand D18, Hall 20, among over 50 square metres of rooflight products including double hipped; mono; flat and pitched slimline. INAGAS, supplier of gas filling machinery and testing equipment, will be exhibiting at the FIT Show alongside distributor partner Edgetech, on C24 in the Visit Glass section. IKON ALUMINIUM SYSTEMS will be showcasing its capability at this year’s FIT Show, Stand J53 (Hall 20). “Our philosophy for the upcoming FIT Show is ‘Brick by Brick’” says Quickslide Chairman Adrian Barraclough. ‘Selling readiness’ will be the key message from SMART READY in its talk ‘Being Ready’ in the FIT Show’s Discovery Theatre at 2.30pm on the Wednesday. RegaLead is to take two stands at the FIT Show in recognition of the two separate markets it serves – N20 at the main show and A24 in Visit Glass. Polyframe has teamed up with Yale to launch the ‘Polyframe Protection Promise’ delivering up to £6,500 in the event of a break-in through correctly configured Polyframe windows and doors. MILWOOD GROUP is claiming a world first with its Ali-deck aluminium decking system, to be launched at the FIT Show, Stand K70. WINDOW WAREHOUSE (UK) is hosting a fire-rated aluminium glazed product day for visitors to FIT Show 2019 . The 27th annual Glass Performance Days conference is set to be the biggest yet with more than 240 presentations over the four days of the June event. Celebrity architect and TV presenter George Clarke has been revealed as the new consumer champion for DGCOS and its partner organisations HIES, and HICS. Foam tape sealing company ISO CHEMIE has launched a new 3D BIM function. ATLAS GLAZED ROOF SOLUTIONS has credited its new Lantern 2.0 for helping the business achieve 26% year on year sales in the first quarter of 2019.